RIVERSIDE, Calif., February 4, 2019 - Bourns, Inc., a leading manufacturer and supplier of electronic components, today announced the expansion of its line of environmental sensors adding an ultra-low 0.15 to 1.0 PSI pressure sensor. Bourns® Models BPS110/BPS120 pressure sensors are based on state-of-the-art Micro-Electro-Mechanical Systems (MEMS) technology, which provides extremely accurate condition readings in a miniature package size. Designed to deliver superior performance in applications where precision is essential, Models BPS110/BPS120 offer fully calibrated and compensated output for more efficient processes as well as long-term stability for reliable repeatability. These features make Bourns' new pressure sensor an ideal solution for a range of industrial, consumer and medium/low-risk medical* designs including portable oxygen generators, nebulizers, CPAP equipment, diagnostic spirometers and gas chromatography equipment. 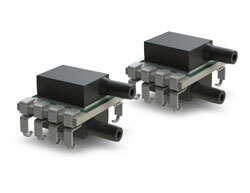 Bourns Models BPS110/BPS120 pressure sensors are available now. Bourns also offers port configuration and calibration customization. For more detailed product information, please go to: www.bourns.com/docs/technical-documents/technical-library/sensors/publications/Bourns_BPS110_and_120_Product_Brief.pdf. Bourns® and the Bourns logo are registered trademarks of Bourns, Inc. and may be used only with the permission of Bourns and proper acknowledgement. Other listed names and brands are trademarks or registered trademarks of their respective owners.